Based in George, the Nelson Mandela University outfit defeated George Cricket Club by four wickets in the final earlier this month. This came after the students eliminated defending champions Union Stars by 12 runs in a nail-biting, low-scoring playoff the previous day. After posting only 104, Madibaz restricted Union Stars to 92, thanks to brilliant spin bowling by Joshua Klue (4/9) and Joshua de Ponte (3/15). It was the first time in a decade that Union Stars, who played in 10 consecutive finals of which they won nine, did not reach the final. George campus sport manager Hugo Loubser said they were elated with the outcome as it was something they had targeted from the start of the season. “We previously won the league in 2013-14 and we said to ourselves from the outset that if can get to the final this time, we are capable of matching any of the teams in the league,” he said. “There are a number of students from schools in the Southern Cape who have decided to study at the George campus as they believe the university can provide the stage for them to perform. 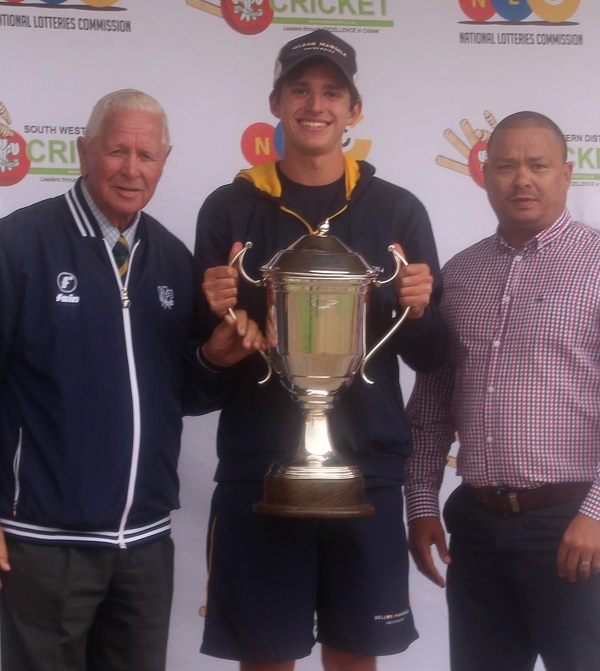 At last year’s University Sport South Africa Week, the Madibaz team, comprising largely of players from the George campus, showed their ability by winning the B section of the tournament. Loubser said a key driving force in their approach was that “nobody is bigger than the team”. “The fear of failure does not exist among the players as they know that you will lose some matches. But the key is to turn up for the matches that matter. He added that the premier league triumph was strong evidence of how cricket had progressed at the George campus. “In 2007, we played in a ‘merchant’ league, which comprised six matches the entire season,” said Loubser. “In 2013 we were promoted to the premier league, having won the promotion league. Adding to their establishment as a leading club has been the development of their facilities. “We had the square rebuilt in 2013 and have since added sight screens, redeveloped the artificial nets and built a stand for players,” said Loubser. “The cricket facility is now often used by SWD Cricket Board as a preferred venue for their SWD Cricket Academy programme. The George students will now, together with the winners of Western Province and Boland, play in a series of matches from March 29 to 31 to determine the Western Cape representatives for the national club championship in Pretoria from April 13 to 17. Loubser said there was a positive attitude in the camp ahead of the play-offs.